It’s hard to find much in the way of inspiration or direction from mainstream architecture these days. Indeed, the profession seems largely on the defensive, lurching towards a nervous breakdown, as big-name architects become global branding tools and conglomerates too big to fail. Miami, meanwhile, forges ahead in its own translucent bubble, now bursting at the seams with flamboyant new buildings by many of the same architects mentioned above, who fly in briefly to leave their mark as construction cranes and cement mixers churn on every block. “The buildings themselves seemed to swim free against the sky,” wrote Joan Didion when she visited Miami in the 1980s, and this is still true today. The sub-tropical sun flattens perspective and diminishes mass. Shadows shift and fold, while true edges lose definition as if in a watercolor wash. Early skyscrapers in New York and Chicago drew energy up from the earth with brooding setbacks, finials, gargoyles and Faustian shadows. In contrast, the recent hi-rises of Miami appear to dangle downwards, hardly touching the earth at all. In certain kinds of light, at certain times of day, the skyline resembles a sun-bleached skeleton, drained of all color and substance. Most of the new towers are self-contained entities, singular shapes wrapped in miles of reflective glass, predictable and bland enough for Dallas or Dubai.Â They are branded by celebrity architects, developers, super models, fashion designers and artists alike, all promoting some unique feature. 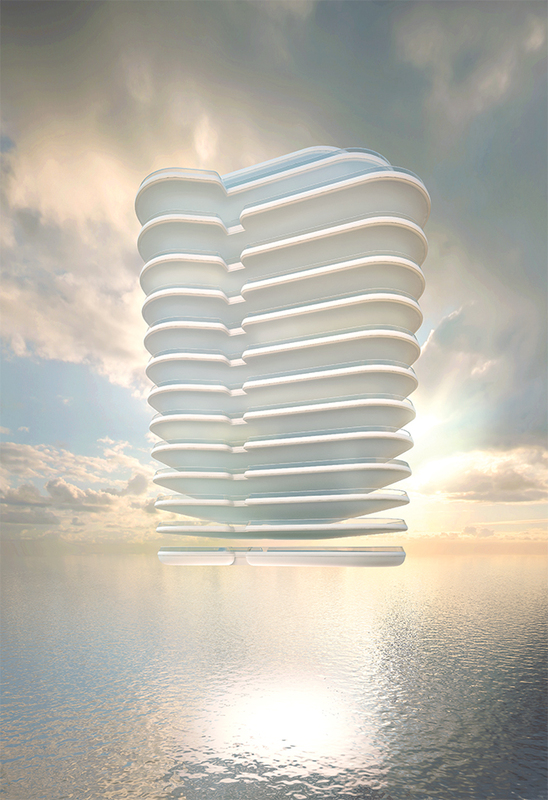 In real estate brochures, the idealized client is a digitally rendered avatar, standing on a cantilevered balcony with a perfect tan, dressed in flowing white garments and looking out to a vast translucent blueness in which ocean and sky are infinitely melded in pure liquidity. There are no other buildings or people evident, no ground plane or streetscape, no signs of rising sea levels or social unrest brewing down below. Miami ranks third in income inequality in the United States, somewhere on a par with Mexico City, according to a commonly used measure, and nowhere is thisÂ let-them-eat-cakeÂ disparity more graphic than the gilded new towers on the Beach and bay when compared to the less affluent parts of the city. A penthouse in Norman Foster’s new tower recently sold for $60 million while a few miles away, there are families living on $10 a day. The Grove at Grand Bay offers a deluxe pet spa and private elevators, while downtown Miamiâ€™s 1000 Museum Tower will feature a rooftop helipad and “custom scenting” throughout. The Fendi Chateau by Arquitectonica, in Sunny Isles, has undulating decks that mirror the movement of waves, wind and clouds; units go for $5-$25 million. 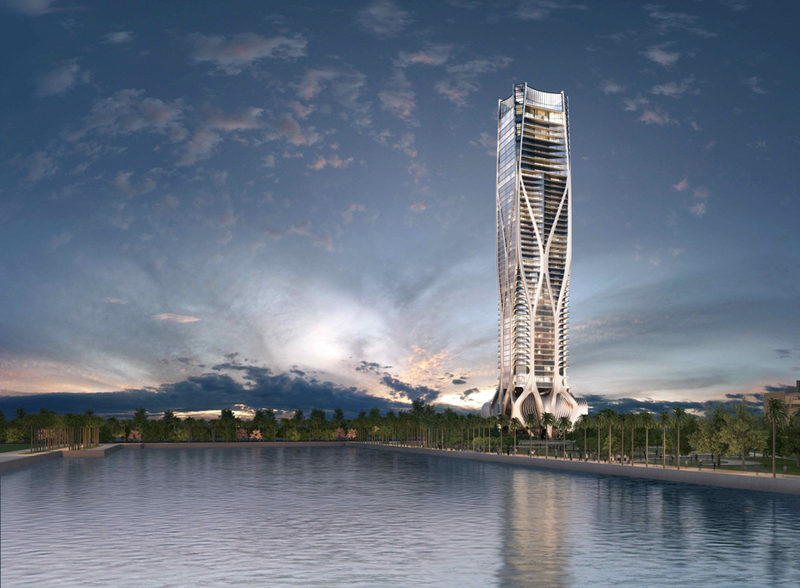 The 49-story beachfront Muse by Carlos Ott is a twisting obelisk with scalpel-sharp edges with units priced from $2 to $6.6 million. The 60-story Porsche design tower resembles a finely tuned piston with car elevators, sky garages and auto concierges for wealthy tenants who can’t stand being away from their Porsches, even while asleep ($4-to-$32.5 million). Pet spas and helipads, aside, the big-name celebrity architect is still the top selling point in Miami’s booming real estate market: Herzog & De Meuron, Koolhaas, Gehry, Piano, Meier, Hadid, Foster. The names are familiar but the list is relatively short, so there’s tremendous demand and a hysterical level of expectation. Their faces and names are emblazoned on construction barriers, t-shirts and tote bags, as if they were luxury brands like Gucci and Prada. At promotional events, they’re treated like rock stars, as was the case with Zaha Hadid who recently made a triumphal entry to the groundbreaking of 1000 Museum Tower only to be swarmed by enthusiastic fans, shoving iPhones into her face and almost crushing her. Referencing Miamiâ€™s tendency toward excess, Rem Koolhass said “One of our theories is that one can offset this excessive compulsion toward the spectacular with a return to simplicity” â€” ironic given the compulsive spectacle of his own Park Grove in which three towers, peanut-shaped in plan, waddle eastwards towards the waterfront of Coconut Grove. The towers feature sky pools and frameless water views to enhance the sense of ethereal suspension, but in the current game of architectural one-upmanship, Koolhaas has already been upstaged by his former protÃ©gÃ©, the Danish wunderkind Bjarke Ingel who designed the nearby Grove at Grand Bay. It’s a project that pushes the genre to a new extreme with structures that lean at 38-degree angles â€” something like dueling tornadoes â€” and appear to helicopter themselves into the upper atmosphere. Even at its best and with the most acrobatic engineering, theÂ luxeÂ condo as building typology is surprisingly formulaic and out of date. It is also unsustainable and politically incorrect, offering no public space, community services, income mix, environmental mediation or otherwise socially redeeming qualities. One notable exception comes from Alan Faena, developer and self-proclaimed “urban alchemist,” who has attempted to shift the paradigm with an entire neighborhood on Miami Beach between 33rd and 36th streets that, when finished, will be curated with eccentric graphics, sculptures and exotic landscaping. Faena is charming in a quiet, Argentine way, showing me through his six-block compound dressed in white hat, white scarf and cable-knit cardigan, pointing out various features of his “city within a city”, a reflection of the man, an urban-scale selfie that includes the softly contoured Faena House by Norman Foster with protruding balconies, called alerosÂ in South America, but resembling an 18-story stack of English crumpets with prices from $2 – $60 million. The sky itself pushes down with a pleated canopy of Altocumulus clouds, buttermilk in hue, not unlike Faena’s cable-knit sweater. I follow him into the “Collaboratory”, a brightly lit sales pavilion where attractive South Americans sit at all-white desks, sippingÂ macchiatosÂ and chatting on I-phones. A table is covered with Koolhaas’s 3D studies for the 10,000-square-foot Faena Forum arts center that will become the ceremonial centerpiece. It is ghostly white, playing foil to passing shadows, with a cylindrical section facing Collins and a cubic volume, slightly torqued, facing Indian Creek. A wedge-shaped void offers entry to a rotunda gallery with spiraling dome and oculus: the Pantheon of Rome meets Konstantin Melnikov’s house in Moscow. When all of these glittering projects are completed, the city will certainly be a different place with 40- to 60-story slabs looming over the beach, blocking out the sun, increasing the demands on already overburdened public services and fragile environment. The question remains: will it be a “Dubai on the Glades” â€” another urban mirage for the super rich â€” or will it be a multi-cultural city with opportunities and resources for every economic class, gender and race? There are clues that point to a more inclusive and sustainable kind of urbanism all around, if one only takes the time to seek them out. AÂ renegade little village called Stiltsville sits precariously above Biscayne Bay and makes for a homegrown metaphor in which simple, indigenous forms rise cautiously above the water. The Miami Marine Stadium by Hilario Candela (1963) straddles both land and sea with seamless equanimity, as does the Palm Bay Club, a three-sided tower by Lawrence & Belk (1972), that literally steps into the waters of Biscayne Bay with two massive piers and hints at a kind of â€œwettableâ€ architecture. There are forms of indigenous flora and fauna that suggest a more naturally integrated approach: the sea-worthy engineering of mangrove trees with their spreading, buttress-like roots; the humble but mysterious Periphyton, a spongy algae that lies in clusters just below the surface of the Everglades, a multi-tasking organism that not only provides nutrients but also filters out pollutants and retains moisture during periods of drought. Here’s a possible model for the future city: low-lying structures that feed and filter the urban environment while adapting to climatic uncertainties, flood or drought. The Swiss architects, Jacques Herzog and Pierre De Meuron, understood the suffused liquidity of Miami better than anyone else when they set out to design a new art museum, foreswearing the tall and monolithic in favor of the everyday and horizontal, inspired as they were by mangrove roots, banyan trees, and the modest, shack-like forms of Stiltsville. The PerÃ©z Museum is horizontally splayed and porous like the oolitic limestone that lies below. It is racked and filleted in layers, open to breezes, even floodwaters. It lies low on the skyline with hovering volumes, deep overhangs and dangling vines. When I first saw it, the scale seemed flimsy, even unfinished, a kind of ruin in reverse. But great architecture can surprise us with a narrative we weren’t even expecting. Now, every time I visit the year-old Perez I experience a low-level buzz of optimism, moments of discovery that I hadn’t seen before. It was as if the building itself were a missing link â€” Superman’s magic crystal â€” for a city in transition that has yet to come fully into being: a Miami that everyone wishes for. Just after New Years, I stood on the eastern deck and looked at the recently completed esplanade that runs along the waterfront and realized that the museum was beginning to extend itself into the surrounding cityscape. Suddenly, I could envision a network of walkways, bike paths, pocket parks, reaching out from the esplanade and unifying the disparate parts of the city, both physically and metaphorically. When I looked across to the Port of Miami, I could see waterways, a fleet of ingenious water taxis and needle-nosed gondolas gliding back and forth, picking up passengers and taking them to destinations across the bay. Without shouting in my ear, the architecture was suggesting all of this and more.